A call to Axel Douque at Ocean Independence brings more information on his latest joint listing with Peter Hurzeler, the 49.68m motor yacht Anedigmi. This superyacht was built to ABS class in 1993 by Oceanco under the name of Achiever. With an exterior design by the late Gerhard Gilgenast, Anedigmi accommodates up to 12 guests in five staterooms and has exceptionally generous deck spaces more typical of a larger yacht. Extensive multi-million Euro refits in 2008 and 2011 see her in as-new condition and twin 1530hp MTU engines give Anedigmi a cruising speed of 14.5 knots and a range of 4,500 nautical miles. 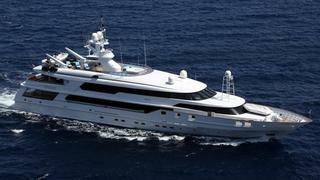 Lying in San Remo, her asking price is €14 million.